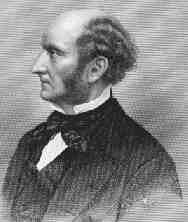 John Stuart Mill was an English economist, philosopher and social reformer. The son of the intellectual James Mill, and friend and disciple of Ricardo, John Stuart Mill was extraordinarily erudite. Having commenced his mastery of Greek at the age of three, he turned to Latin, mathematics, logic and economics. Having reached man’s estate, he became a Member of Parliament and wrote prolifically on philosophy, logic and politics as well as economics. In his classic work On Liberty (1859), he states his philosophy of the supremacy of individual liberty. His major economic work Principles of Political Economy (1848) rapidly became the leading text for the study of the subject. The last of the great classical economists, Mill consistently emphasised policy recommendations arising from his analysis.